AJ and I decided to take a day trip to Beacon, NY last weekend. We needed a little getaway, but we don’t have the time or money to spare for a longer trip right now. 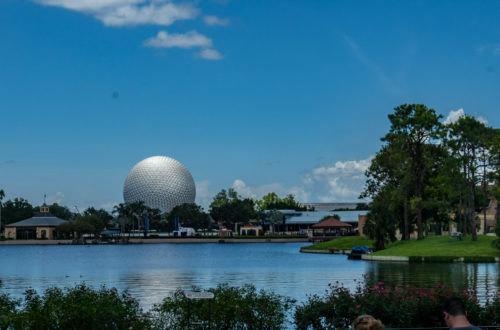 (Our Disney Global Tour is getting closer!!) 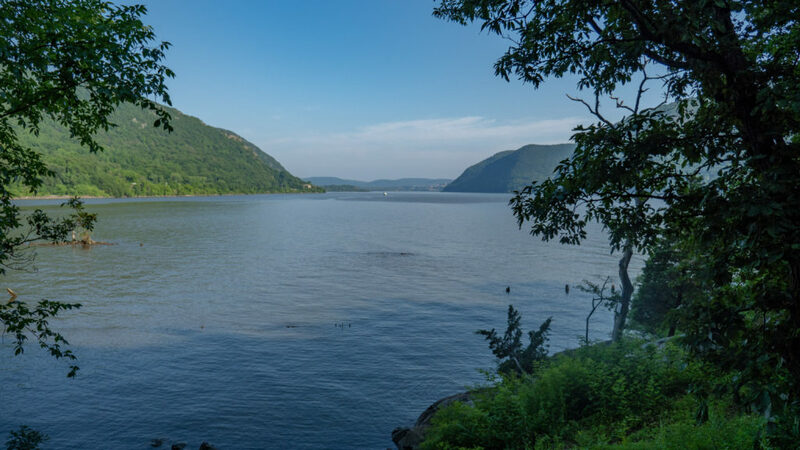 Beacon has a lot of art and culture to offer, and it’s an easy and convenient day trip from New York City, or, in our case, Connecticut. 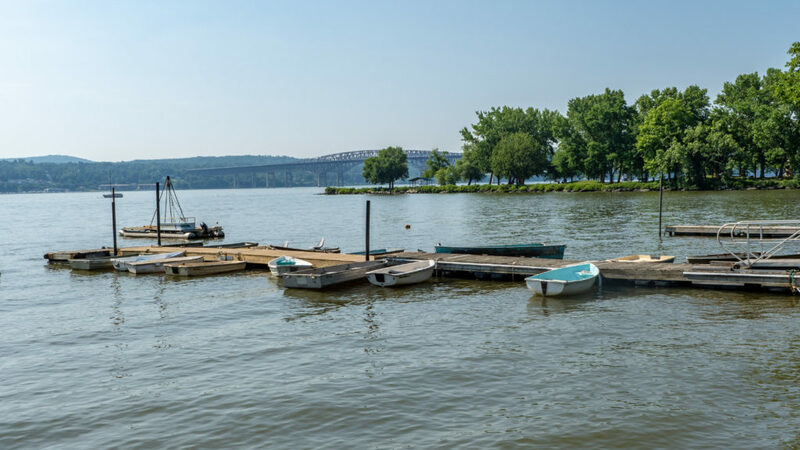 Situated along the Hudson River and located about 60 miles north of New York City, Beacon is the result of a merger between two settlements: Matteawan and Fishkill Landing. 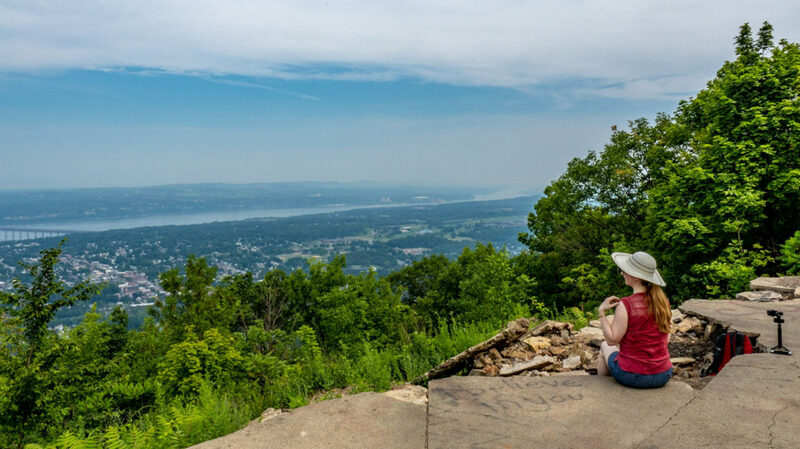 It was named Beacon because of the beacon fires lit by the Continental Army on the top of Mount Beacon during the American Revolutionary War. To get there from the city, you’d simply take the roughly one-and-a-half-hour Metro North train ride from Grand Central to Beacon. There’s a ton of stuff within walking distance of the station. In fact, everything we did would have been walkable. But, since we have a car, we drove. We got off to a slightly later start than we’d planned because the car was out of gas and wouldn’t start. Oops! Luckily there’s a gas station pretty close to our new apartment. After a quick run over there by AJ (and a quick shower to wash off some stray diesel), we were on our way. By about 9:30, we had arrived at the Mount Beacon Trailhead. There are several trails in the area, but it was the Casino Trail with its overlook terrace that we were after. 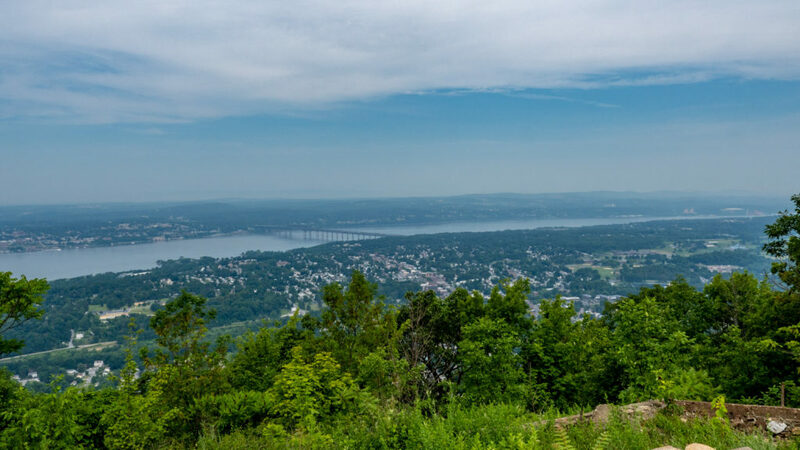 The Mount Beacon Incline Railway, once the steepest railway in the world, carried early 20th-century vacationers up the side of this mountain to the Beaconcrest Hotel and next-door Casino. Both of the buildings were destroyed by fire in the late 1920s, and the Great Depression prevented a return to glory for the mountaintop resort. 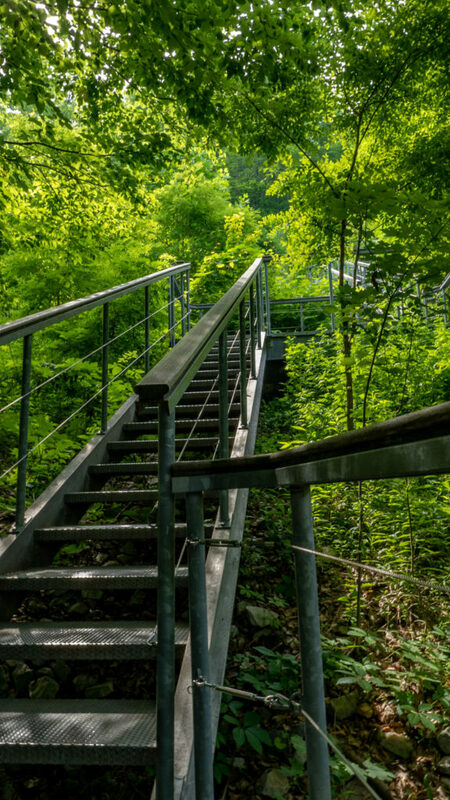 The trail starts with a few flights of steps that follow the remains of the railway. From there, it continues its ascent, switchbacking over the mountain with a very rocky trail. In all, it’s about a mile to reach the top. 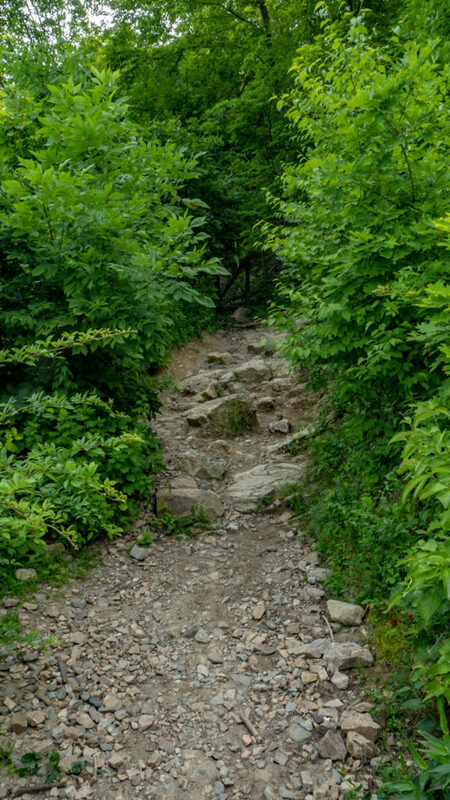 I was a little nervous about doing this hike, because my knee is still recovering from the fall I took a few weeks ago while hiking on the Appalachian Trail in the rain. If you didn’t catch that fun story, it’s here. With physical therapy and lots of icing, it’s getting better! I was very pleasantly surprised at how little pain I felt hiking. After spending some time at the top admiring the view, we made our way back down, stopping at the grafittied ruins of the old railway wheelhouse along the way. Guys. It was hot that day. Like literally 100 degrees. By the time we’d finished the hike, I was feeling like immersing myself in a pool of ice water, and it wasn’t even noon yet. From the trailhead area, we drove into the town and parked on a side street near the Beacon Flea Market, just off Main Street. 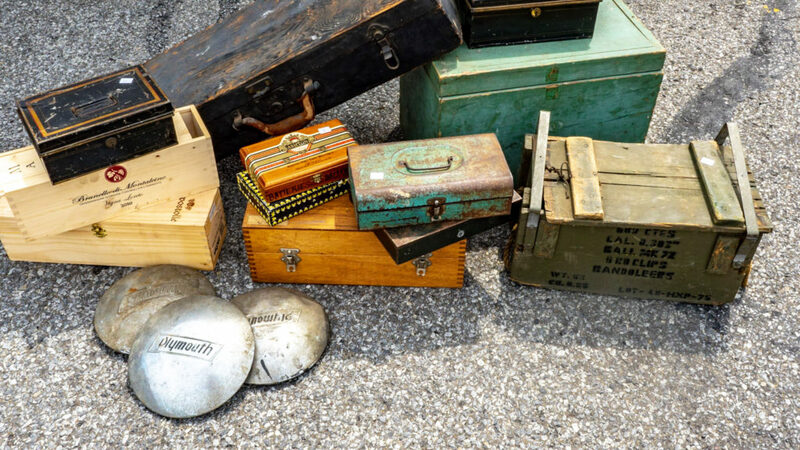 The flea market is open every fair weather Sunday from spring through fall. They’re apparently very particular about the vendors they’ll allow to sell there, so you won’t find anything mass-produced. 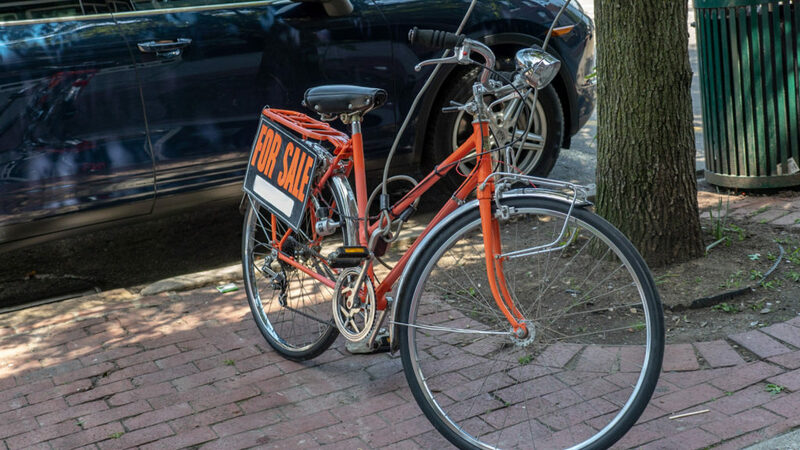 It’s a lot of locally-made items, antiques, and estate sales. Even though I was expecting there to be more vendors than there were, we did see some pretty cool stuff. There were decorative knick knacks, some locally-made t-shirts, various dishes and cups, and lots of jewelry. I bought two necklaces and a bracelet for three dollars! 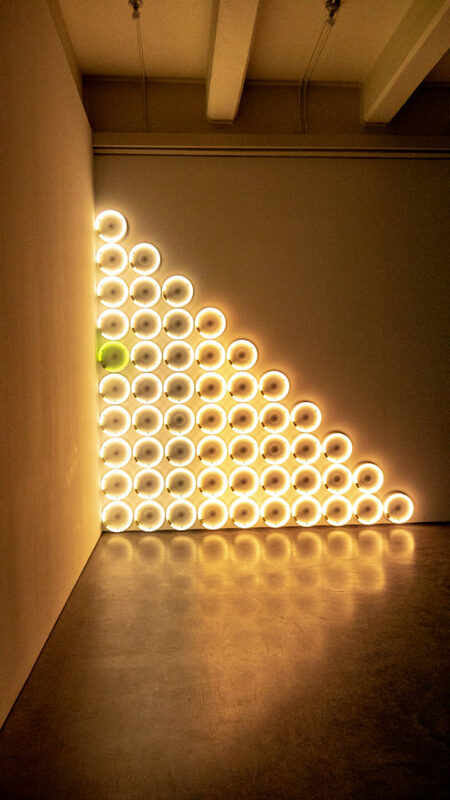 Like a Beacon in the night… see what I did there? The Alps Sweet Shop has a wide variety of interesting chocolates. They have other candy too, but that was not my focus. They offered us a sample of freshly-made chocolate-covered potato chips – salty and sweet with a mixture of crunchy chip and creamy milk chocolate. I opted to buy a few different pieces, mostly (okay, all) dark chocolate. 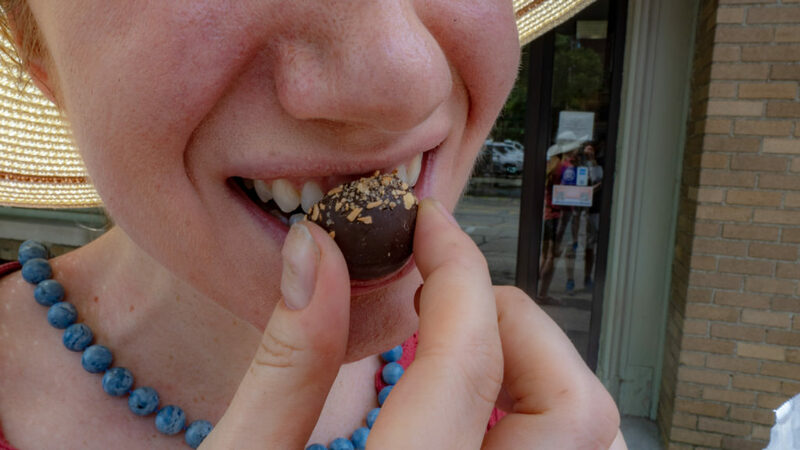 My favorites were the black raspberry truffles and the chocolate-covered candied ginger. Delicious! Since it was noon and we hadn’t really had a proper breakfast (see: car debacle), we decided it was definitely time for some lunch. 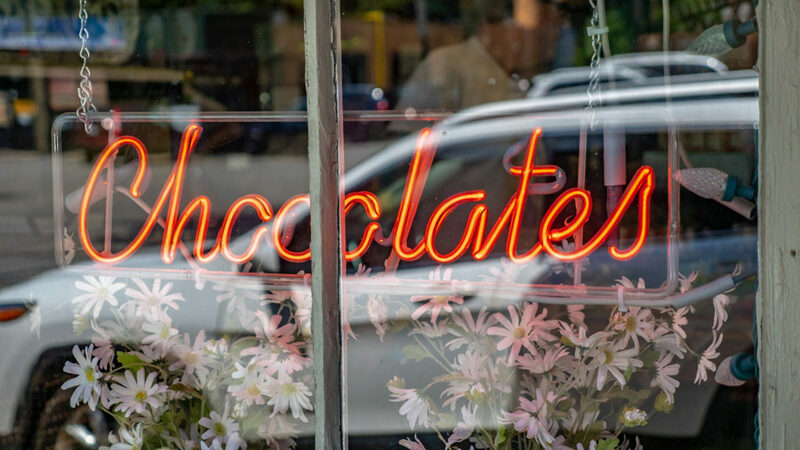 After leaving the chocolate shop with a promise not to leave the chocolates in a hot car, we spotted an appealing-looking spot called Meyer’s Olde Dutch. Walking in, we were greeted by a friendly server who explained the menu and the specials. She invited us to take a seat and order at the counter when ready. The menu is deceptively simple. It’s mostly burgers and sandwiches with fries and simple salads. But wow, they do them really well. 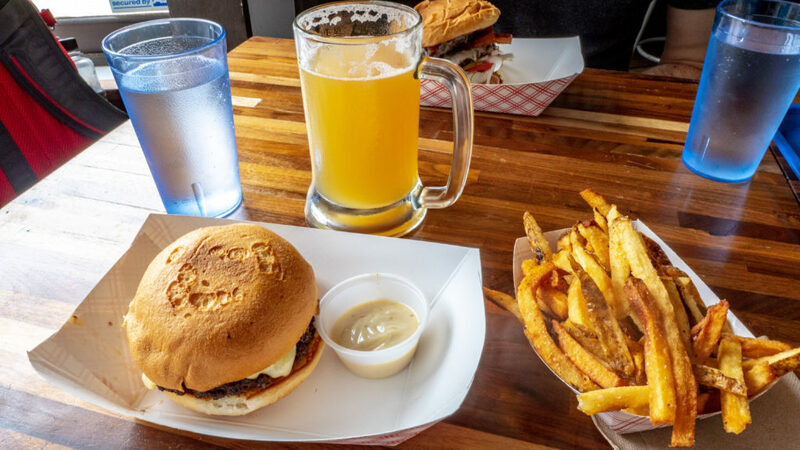 The burgers are from a local purveyor, flavorful and juicy on a nicely-toasted bun. The fries are “double cooked” to crispy perfection. AJ said his burger was the best he’d had in a long time. That’s high praise coming from the Burger Connoisseur. I thoroughly enjoyed mine as well. I washed it down with their IPA on tap. A perfect post-hike meal. We continued our meandering, ducking into a shop here and there. Well-established shops that seem to have been in business for decades mingle with new-age potion stores, psychics, and art galleries. One crazy highlight was a $7,000 wood carving of Yoda with the face of Gandhi. Maybe there’s a deeper meaning there that I’m missing? 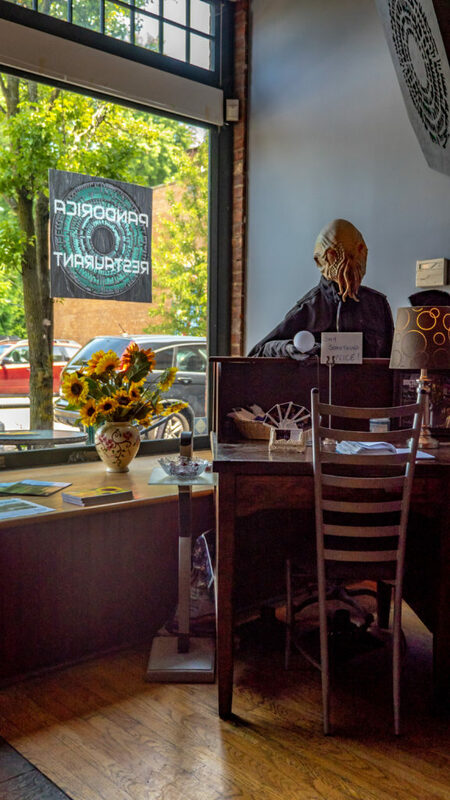 Toward the western end of Main Street, we came to Pandorica, a Doctor Who-themed restaurant that I had come across in my research. Some of the reviews of this place are not so great, saying that the service and food are pretty bad. I was admittedly wary of going there at all. 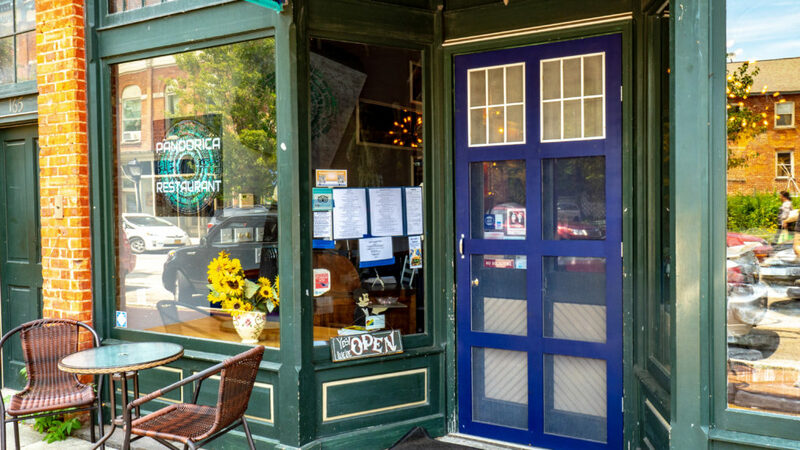 But, come on, a Doctor Who-themed restaurant! We had to at least go in. We entered a little tentatively, admiring the life-sized Weeping Angel in the front window. The owner greeted us warmly, and we asked it it would be okay if we just ordered some tea and dessert. “Of course!” she replied and invited us to sit down. Our server was equally pleasant. 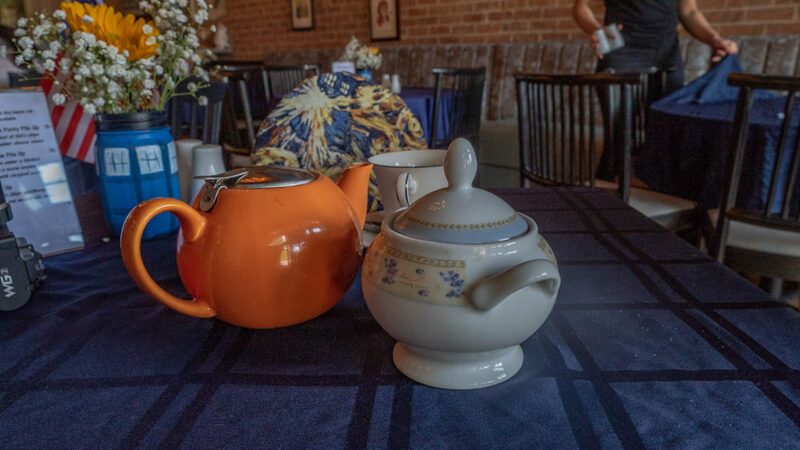 My tea came with a cute Vincent van Gogh Tardis tea cozy that matched the painting on the wall of the restaurant. AJ enjoyed a brownie sundae while I sampled the gluten-free, dairy-free coconut rice pudding. We watched the adventures of David Tennant and Catherine Tate while an Ood (also life-sized) smiled serenely upon us. Wait, do you think Ood can smile? I think Yelp is a good tool. But this was a good reminder that sometimes it’s worth it to give a place a chance, even if it has some bad reviews. The next place we went into was Hudson Beach Glass. 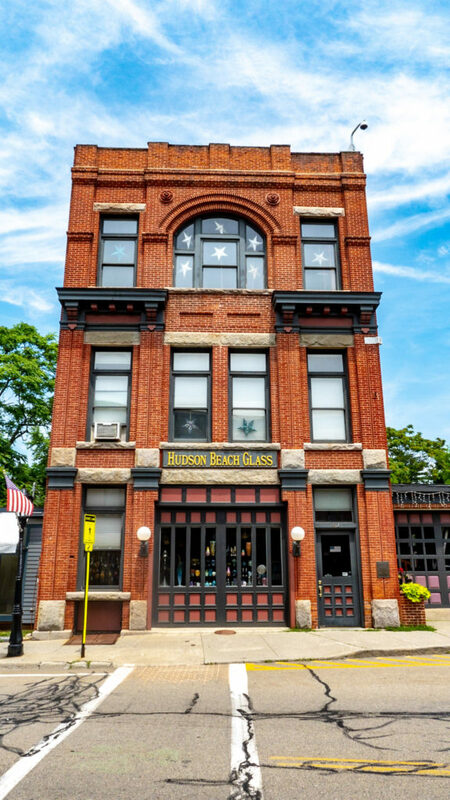 This store/gallery is filled with a colorful array of functional and decorative glass objects – jewelry, bowls, paperweights, soap dishes, and vases, to name a few. Some of the pieces are quite expensive, but rightfully so, given that they’re all handmade. If you’re looking for a unique souvenir or gift from Beacon, this place has a lot of great options. We headed back to the car at this point and drove over to Dia, a modern art museum that also has a branch in NYC and several stand-alone installations that it maintains. Dia:Beacon is a converted Nabisco box-printing factory. 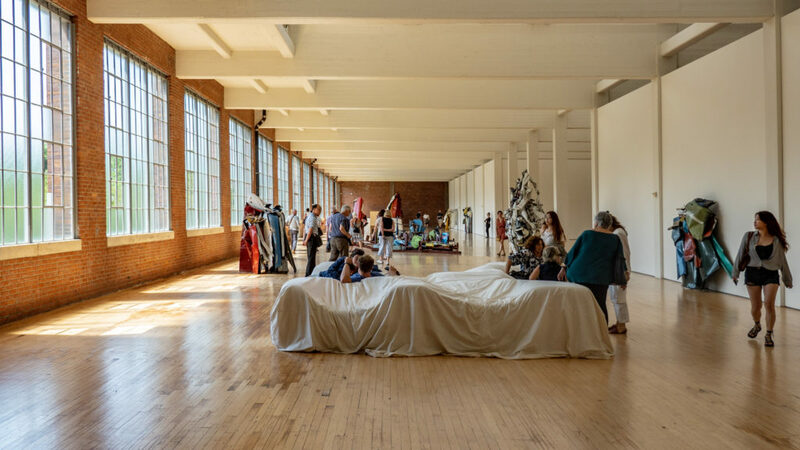 The skylights, industrial brick, and sheer size of the building make it an interesting place to showcase art from the 1960s to the present. I’m feeling hesitant to give my true opinion of the art in this museum. If abstract art is your thing, you will probably love Dia. Suffice it to say, abstract art is not my thing. There may be a very long-winded explanation about “sculpting the negative space” and “not wanting to be confined by conventional materials.” But the truth is, somebody took two strings and suspended them between the floor and the ceiling and called it art, and now it’s in a museum. I find this sort of celebration of mediocrity in the arts to be objectionable. Oops, I guess I gave my opinion anyway. But look, it’s still a chance to broaden your horizons, even if you prefer other types of art. Plus, it’s air conditioned! That’s a quality that should not be underestimated. Our next stop was the Beacon Institute Dock on the river side of the Metro North train station. 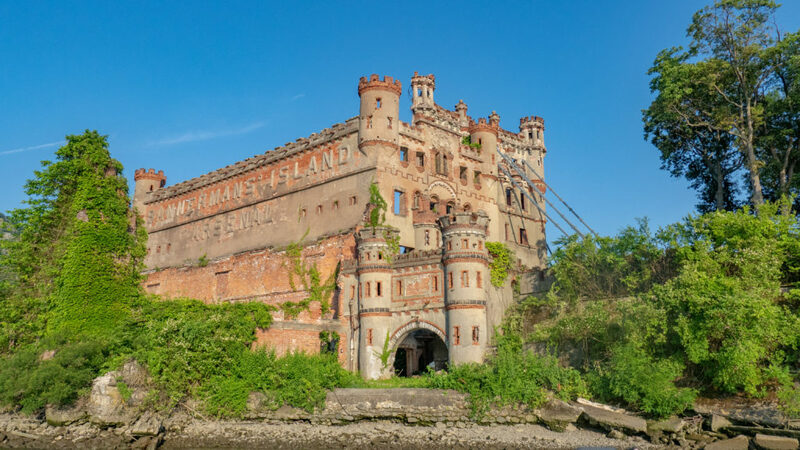 This is where the boat would pick us up for the Bannerman Castle Trust’s guided tour of Pollepel Island. We tried to find a little shade while we waited for half an hour for the tour to begin. The boat eventually pulled up and we set off on the half-hour journey to the island. Thankfully, the boat had a full-sized canopy to keep the direct sun off of us. We might have melted otherwise. 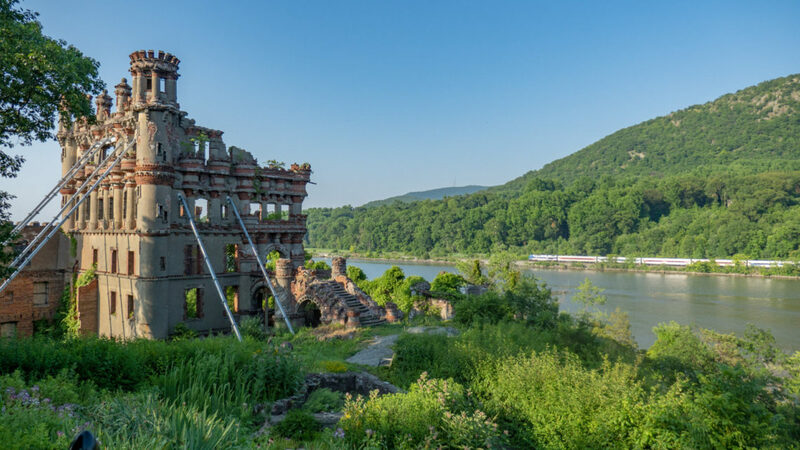 Pollepel Island, home of the remains of Bannerman Castle, was purchased by the prominent arms dealer and self-made man Francis Bannerman IV in 1900. He needed a place to house his huge inventory, so he decided to build one that was reminiscent of the castles in his ancestral home of Scotland. After his death in 1918, the warehouse/castle suffered a series of disasters – a gunpowder explosion, a fire, and further collapse under heavy snow. Very little remains of Bannerman’s buildings. The whole island is now the property of New York State. Luckily, our tour guides were mindful of stopping in the shade when giving the different portions of their talk. Even so, I felt like I was in an oven. We ended up ducking out of the tour a few minutes early to get back to the boat. Not-so-coincidentally, that allowed us to snag the prime seats for taking photos of the castle and island as the boat made its way back to Beacon. 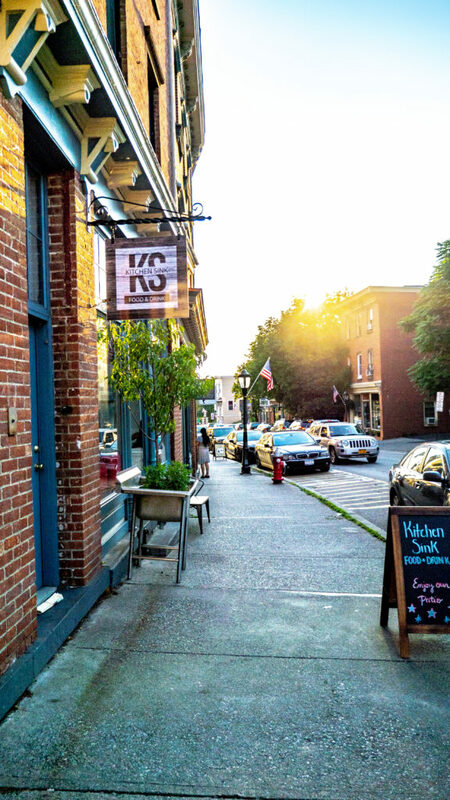 Our final stop of the day was for dinner at Kitchen Sink Food & Drink. It’s a small, homey place that’s decorated with some really cute details. For example, the light fixtures are repurposed faucets. 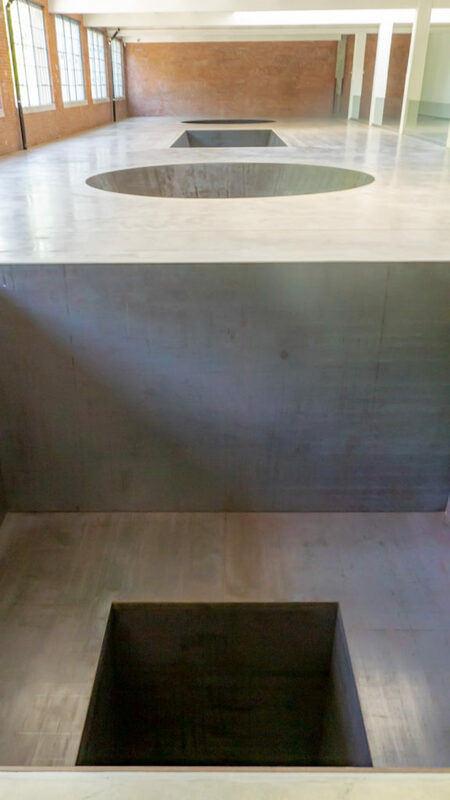 Kitchen Sink… get it? 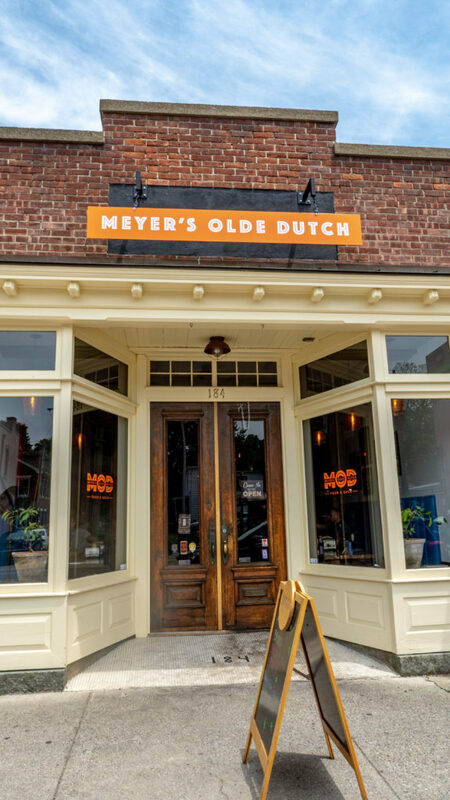 Although we didn’t know it before we sat down, Kitchen Sink is actually owned by the same people as Meyer’s Olde Dutch. We found that out when the waiter directed some of our fellow tourists to MOD when they didn’t have a reservation. Good thing I planned ahead and made a reservation! Aside from needing to drink a lot of water, we were also very hungry from our afternoon excursions. So we ordered pretty much all of the things. Kitchen Sink sources locally whenever possible, and they even have their own family farm. That is very evident in the flavor of the food. The greens in our salad tasted like they were just harvested. We also had a very refreshing cucumber and strawberry gazpacho. For the main course, AJ had the porchetta, and I opted for the tilefish. Both were very well-executed and tasty. 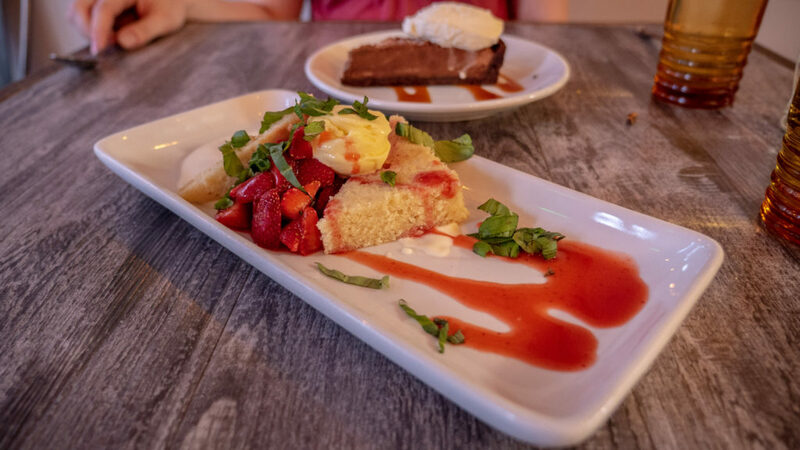 We still had room for dessert, so we shared the strawberry shortcake and chocolate semifreddo. See, there I go with the chocolate again. 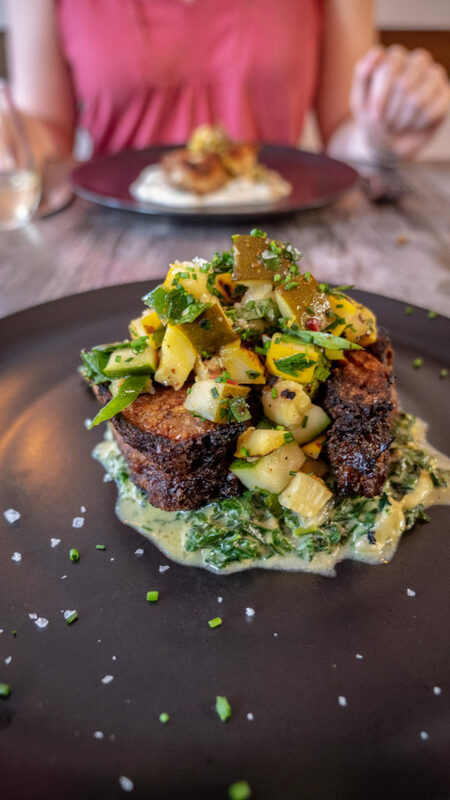 It was the kind of meal that leaves you feeling very satisfied but not stuffed. We would highly recommend it. 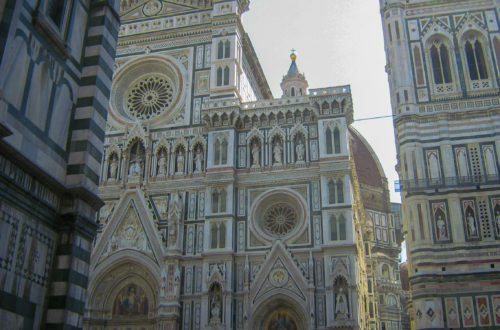 I tend to focus mostly on traveling to foreign countries and am always looking forward to planning my next international trip. With that mindset, I sometimes forget that there are very cool places still to be discovered right in my own backyard. 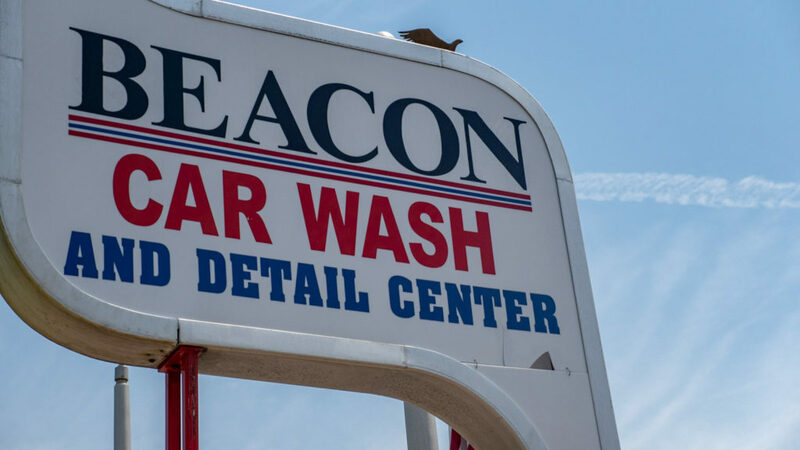 Beacon was a delightful mini-vacation for us and a reminder that we don’t have to go far in order to travel. 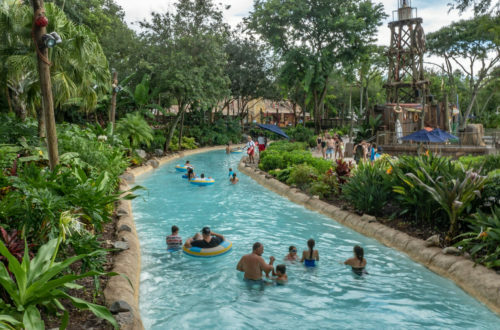 What’s your favorite day trip that’s close to your home? Tell us about it in the comments below!